As Rommel retreated from the El Alamein battlefield he receives that Allied troops have landed at the opposite end of North Africa, in Morocco and Algeria. The Vichy French garrisons fought against the Allied invasion force, but once Hitler sent troops into the unoccupied zone of metropolitan France, the Vichy units ended their loyalty and the way was clear for an Allied pincer movement against the Axis army in North Africa. On November 8 1942, Anglo American armies landed on the north coast of Africa between Casablanca and Algiers in an operation that still excites incredulity when its details are examined even though such enterprises as the Sicily and D-Day landings, the war in Korea, the Six-Day war, the Falklands conflict and Desert Storm have taken place since that time. A Fleet of 102 ships, including 29 transports carrying 35,000 American soldiers with all their impedimenta, had crossed the 4000 miles of the Atlantic to Casablanca; another task-force 39000 US soldiers and escorted by royal navy escorts had left the Clyde on October 26, passed through the straits of Gibraltar and landed at Oran, while a third which left the Clyde at the same time went on to land at Algiers. The third force carried 23,000 British and 10,000 American troops, and some 160 Royal Navy ships had been used as cover down the Atlantic and into the Mediterranean to the 250 merchantmen carrying the forces from the Clyde, only one transport of the entire fleet had been lost to enemy action, the men aboard quickly being transferred to landing ships, which took them ashore. By the end of the first day at Algiers the men were all ashore, despite a brisk resistance from French marines and native troops during the first attempt to storm the port. At Oran the plan to encircle the city had gone well and the troops had all disembarked, but by evening it was becoming evident that the French troops were organizing a strong defense. At Casablanca although the landings had all been virtually unopposed, to the surprise of the charismatic commander, Major General George Patton, a measure of confusion had delayed the deployment of Allied troops. By the end of the second day, a combination of poor administration and growing french opposition seemed likely to block expansion of the beach-head. From the beginning one of the great imponderables of the entire operation had been the extent of opposition which might be expected from the French. After centuries of Anglo-French antagonism, exacerbated of the French fleet by the Royal Navy after the fall of France, plus the attacks on French positions at Dakar and in Syria, it was considered unlikely that even the grim realities of German occupation would persuade the French to lay down their arms and welcome the British soldiers as liberators. But the relationship between France and the United States had been close since the days of Lafayette, and many US troops and their commanders expected something more in manners of brass bands and flag waving to greet their appearance, than the doubtful approaches and occasional shots that occurred during the first few hours ashore. Attempts had been made to clarify the situation before the landings – Major General Mark Clark had been smuggled ashore by British Commandos and had talked to General Mast, commander of the French troops in the Algiers sector, while the chief US diplomatic representative in North Africa, Robert Murphy, had tried sounding out French military opinion throughout the whole theater. But such investigations must be very tentative, and security demanded that the Americans gave very little specific information to the Frenchmen who might have been attempting to entrap them, and who would in any case remain under German control after investigation. As a result, the landings came as almost as much of a surprise to Mast and his associates (who genuinely wanted to help as much as they could), as the remainder of the French forces. These all certainly disliked the German occupation, but they were unsure of where their real responsibilities lay. As a result their resistance during the first few days was patchy, sometimes fierce, sometimes hesitant, but never prolonged as a result of their commanders doubts while they awaited orders from some properly constituted authority. That authority was vested in Marshal Petain, but by good fortune for the Allies his deputy, Admiral Darlan, was in Algiers visiting his son who had recently contracted Polio. The Admirals immediate reaction was not promising (I have known for a long time that British were stupid, and always believed the Americans were more intelligent) and his reputation as a Nazi collaborator would have made him a most unwelcome ally had he not been so important. By a combination of diplomacy and straightforward bullying however, Mark Clark persuaded him that his best course of action would be cooperating and at 1120 on the morning of November 10, Darlan ordered and end to all French resistance in North Africa. Generally he was obeyed in Morocco and Algeria though the extraordinary rapidity of the German reaction in Tunisia held up matters there, but the whole picture was clarified when the news came in that Hitler’s furious reaction to the Anglo-American landings had been to order German troops to move into the Unoccupied Zone in southern France, which they did on November 11. This, in the opinion of the French command in North Africa, relieve them of their pledge of obedience to Petain who they judged, quite rightly, would now be acting under some duress. From then on, the Allied moves went smoothly. 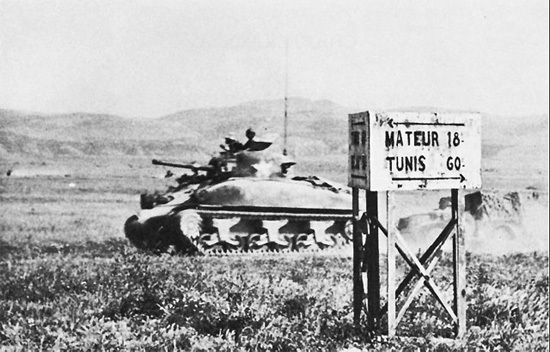 By November 12, British airborne forces had been dropped at Bone and had captured the airfield there, later they had advanced to Souk El Arba, 300 miles east of Algiers, while the US 503rd Parachute Infantry Regiment had dropped at Youks Les Bains nearly 100 miles to the south and within two days had taken Gafsa airfield inside Tunisia. Behind them, US troops had shaken out and were moving up, Lieutenant General Kenneth Anderson had landed and taken command of the British First Army, which was commandeering every piece of transport it could as the long slog across North Africa began in earnest.